Q: What’s the difference between these sentences? Most people like to live in the city. Most of the people like to live in the city. *Almost people like to live in the city. (The star indicates an ungrammatical example). A: First off,  and  are grammatical, while  isn’t. The reason for this is the parts of speech (or lexical categories in CGEL terminology) that most and almost belong to. Traditionally speaking, the simple subject in  is people modified by the adjective most. And the complete subject is most people. In a modern analysis, the subject is the noun phrase (NP) with the noun people as the head. Most is a determinative (many learner dictionaries use the term determiner, see here for a list of English determinatives) in the determiner function (see the endnote here). Whichever way you look at it, this is just what you would expect, and no doubt what most learners are aiming at when they say things like . The meaning here is that we have the set of all people—all people in the world or all that we can imagine—and most—a majority of them—like to live in cities. 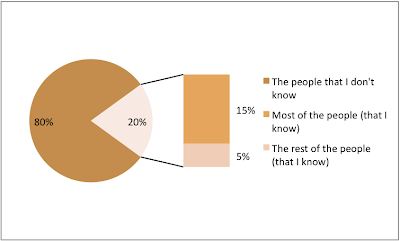 This is depicted in the following pie chart. (It appears that for some people, most means a large majority or nearly all). Figure 1. Pie chart illustrating the meaning of most people. Now consider . The traditional analysis would have most as a pronoun here modified by of the people1, which is different from the traditional analysis of  where most was an adjective. In CGEL, most is a determinative in both sentences, and in , most of the people is called a partitive construction. Traditional or modern, though, we still have most, meaning ‘a majority.’ The difference is that in  our set has changed; it is no longer a majority of everyone. Now we have the people; in other words, we’re talking about a specific set of people. It may be the people in Ontario, or the people you know, or any other set that is understood by the speaker and the listener. Thus, in Figure 2, the entire circle is all people. The light-orange and yellow sections are the people I know. Figure 2. 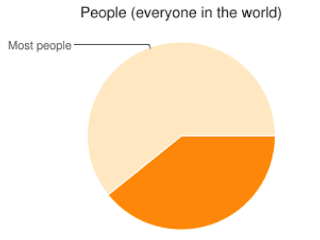 Pie chart illustrating the meaning of most of the people. So, while most people means ‘the majority of the people in the world’ (or all those we can imagine), most of the people means the majority of a specific group. Finally, we come to the mistake: almost people. What the learners mean here is ‘most people’ or perhaps ‘almost all people,’ and indeed, had they been speaking a few hundred years ago, almost people would have been understood in exactly that way. Ascham (1570), for example, wrote, thies giuers were almost Northenmen (i.e., ‘These givers were almost all Northerners.’) Today, though, almost is a degree adverb (like more, just, & only) meaning ‘nearly, but not quite.’ As a result, if you say that the people who like living in the city are “almost people,” you mean that they are nearly but not quite people; perhaps they are humanoid robots, Neanderthals, or avatars. This kind of vivid, humorous explanation is likely to stick in students’ minds, but you shouldn’t expect it to cure them of the almost affliction. Implicitly, though, they allow that certain adverbs can modify noun phrases (NPs). For example, in Teach Yourself English Grammar, Phythian discusses the correct placement of adverbs. He writes that in the sentence only the bridegroom hired a suit for the wedding, “the sense is that only the bridegroom (and no-one else) hired a suit” (p, 77). Clearly, here, only is modifying the NP the bridegroom. The adverb almost is unusual in that it does occasionally modify nouns as in 4 and 5. 4. It was as he began drawing a third and realizing the strange feeling of the almost stillness about him that he heard a new kind of sound at the side of the garden nearest his hiding-place. 5. ?I am tired from the almost week of walking under a pack. Since this isn’t that common, it’s unlikely that learners have noticed it, but it is one more possible source of confusion surrounding this construction. 6. He made a choked sound, almost a sob. Most English teachers know this intuitively but may never have realized it consciously. So be careful when you tell your students what adverbs do and don’t modify. 1. I couldn’t actually locate a traditional grammar that discussed this particular construction. If you know of one, let me know. Thanks again to Marianne Vespry and Randy Alexander for their editorial exhortations and proofreading prowess! 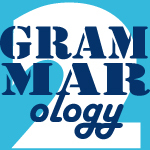 Grammarology 2.0 aims to take the dicsussion of grammar up a notch or two (your mileage may vary) and should appear about once every two weeks. It’s written by Brett Reynolds, who teaches EAP at Humber College and is just about as nerdy about grammar as you can get. He’s is always happy to take questions, which you can send to info@tesltoronto.org.